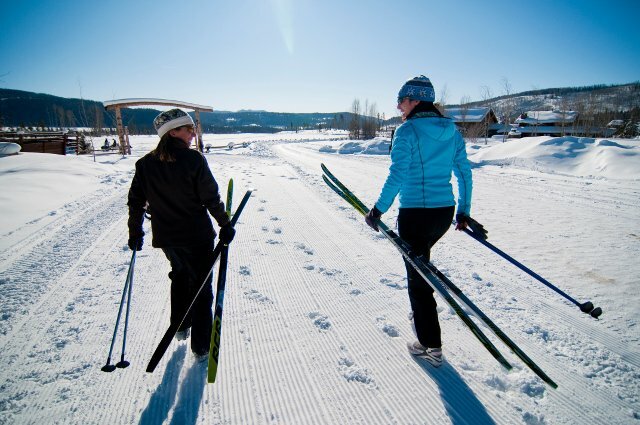 In North America there is almost nothing that compares to a winter in Steamboat Springs, Colorado and the Vista Verde Guest Ranch is one of the best places to experience all the outdoor activities as well as luxury that the area has to offer. Sample a variety of outdoor fun from your home base at the all-inclusive ranch with winter include guided back-country skiing and showshoe tours. Prices include gourmet meals, snacks, beverages – including wine and beer – airport transfers and staff gratuities. You can also choose accommodation-only rates and pay a la carte for your activities. Stay in a lodge room or a standalone cabin with up to three bedrooms, a private hot tub on the deck and a fridge stocked with complementary beverages. Transportation to and from Steamboat for ski days is provided, and with an annual snowfall topping an average of 349 inches, the area’s claim to fame is the incredible deep-powder skiing. Steamboat is actually a complete mountain range: Mount Werner, Sunshine Peak, Storm Peak, Thunderhead Peak, Pioneer Ridge and Christie Peak. There are 165 named trails spread over nearly 3,000 acres with a little something for skiers and boarders at every skill level with the longest run covering 3 miles. Freeriders flock to the Maverick Superpipe located in the terrain park and won’t be disappointed with the thrill. Maverick is 450 feet long, 56 feet wide, and has 18 foot walls with a 22 foot transition. If that’s a little much for your skill level, warm up your moves at Mini-Mav – a scaled-down version of the superpipe that’s great for novice riders. A total of 16 lifts including the 8-passenger gondola and 5 high-speed quads keep things moving, and the area has an unbelievable uphill capacity for 41,465 per hour. Many come specifically to try the wooded areas of Pioneer Ridge and Storm Peak where the legendary champagne powder frosts the trees and challenges even the most avid powder hounds. Back at Vista Verde after a long day on the snow you can enjoy family-style dining or a quiet candlelight dinner. Be ready to relax and disconnect as there are no phones or televisions in the guest quarters, but the ranch does have wireless. It also has a kid’s play zone and loads of special activities for teens and children. Winter at the ranch also offers sledding, horseback riding and sleigh rides. For a separate fee guests can try dog sledding, snowmobiling, ice climbing, and wind down with massage treatments. With a capacity of just 45 guests, Vista Verde has a homey, friendly vibe. The 500-acre ranch sits at an altitude of 7500 feet and is located about 25-minutes outside of Steamboat. It borders thousands of acres of National Forest land providing for spectacular views of the Colorado mountains. All-inclusive rates start from about $475 per night.